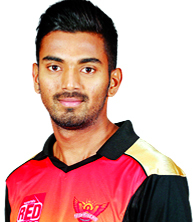 Born on April 1992, Kannaur Lokesh Rahul, commonly known as KL Rahul and also as Lokesh Rahul, is an Indian cricketer who plays for Karnataka in domestic cricket. He is a right-handed batsman and occasionalwicket-keeper. Rahul played for India at the 2010 ICC Under-19 Cricket World Cup. Rahul started his international career debuting against Australia in the 2014-15 Test series at Melbourne. In his second Test match at Sydney, he scored 110, his maiden Test century. 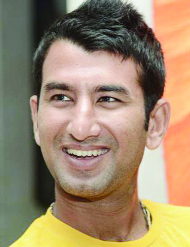 Rahul made his debut in the 2010-11 season, playing first-class cricket for Karnataka. He made his debut in Indian Premier League in 2014, playing for Sunrisers Hyderabad. He became the first triple-centurion for Karnataka in a first class match on 30 January 2015, playing against Uttar Pradesh and scoring 337 in M Chinnaswamy Stadium, Bengaluru. His knock of 337 came off 448 balls and included 47 fours and 4 sixes. He also made 188 runs in the Final and finshed the same Ranji season with an average of 93.11 in the nine matches he played. He was a part of 15-man squad for the tour of Bangladesh in June 2015 but later withdrew due to dengue fever. He then made a comeback into the Test team in the first Test of the Sri Lankan tour after Murali Vijay was ruled out due to a hamstring injury. But he did not show any progress in the first match where he got out early in both innings for less than 10 runs. In the second match of the series, Shikhar Dhawan lost his place due to injury and ruled out from the rest of the tour. So, Rahul got a chance to show his talents once again where he made his second Test century of 108 runs from 190 balls including 14 fours and 1 six. 1. Who took 5 wickets for India A in the match of the ongoing Series against South Africa A? 2. For which team jp Duminy played in IPL-8? 3. Who was nominated Jt Secretary, Jammu of J&K State Sports Council recently? 4. Which batting rank Virat Kohli holds in World Cricket? 5. Who is SM Bali? 1. Karun Nair 2. Sunrisers Hyderabad 3. Javed Shah 4. No-1 5. President JKFA and Jt Secretary, Kashmir J&K State Sports Council. The best entry of this week was received from Ravinder Abrol, Talab Tillo, Jammu. The other entries of the week were from Sanjay Dhar, Lane No 1, H No-3, Upper Laxmi Nagar, Sarwal Jammu; Sweety Koul, Bank Colony, Gole Gujral, Jammu; Sumit Kumar, Krishna Nagar, Jammu; Satish Kumar, New Plots, Jammu; Pawan Pakhetra, Janipur, Jammu and Mohd Mudasir, Jawahar Nagar, Srinagar.